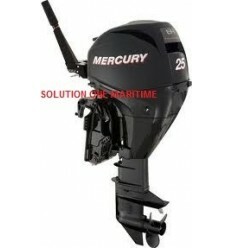 Mercury Sort Of Portable Outboards 25 HP - 30 HP There are 2 products. Mercury Outboards ME25SHS4S FREE SHIPPING TO LOWER 48 STATES ON THIS ITEM Every 25 and 30hp Mercury Fourstroke utilize a three-cylinder engine design that delivers better inherent balance than the twin cylinder designs used by competitive outboards. Mercury’s three cylinder approach results in a smoother and quieter user experience. Mercury Outboards ME25SHL4S FREE SHIPPING TO LOWER 48 STATES ON THIS ITEM Every 25 and 30hp Mercury Fourstroke utilize a three-cylinder engine design that delivers better inherent balance than the twin cylinder designs used by competitive outboards. Mercury’s three cylinder approach results in a smoother and quieter user experience.